Balancing fibre and grass to cut costs in high yielding herds. Mike King and his brother Chris run the Kingspool Holstein herd at Two Pools Farm in Iron Acton, Gloucestershire, alongside their head herdsman Alan Roberts. With the herd established almost 100 years ago, and now numbering 550 year-round calving cows averaging 10,300 litres per cow, the team maintains a tight hold on welfare. Mike first started using NIS last year after he suspected he might have some subacute acidosis in the herd, and called his consultant and vet James Husband from EBVC to take a closer look. The problem seemed to be causing inconsistent rumen function in the high yielding group – as shown by variable dung quality ranging from very firm to very watery. So first of all James suggested taking out the 1kg of chopped straw to increase nutrient density, then swapping the 4kg soya hulls with 4kg of NIS pellets, with the aim of increasing the level of digestible fibre at a very slight decrease in cost – 6.98ppl to 6.92ppl. The other complication was my milk contract had recently changed and I had to hit at least 3.8% to avoid a hefty 0.5ppl penalty. So I was hoping that as well as address the cows’ health issue, the combined effect of the dietary changes would increase butterfat levels from the 3.7% they were then running at. He confirms the change had a positive effect on high yielders, who progressively improved in terms of consistency of digestion and manure composition over coming weeks. “They seemed to be getting a lot more from the forage and were eating an extra 3.5kg freshweight or 1kg dry matter each day, says Mike. 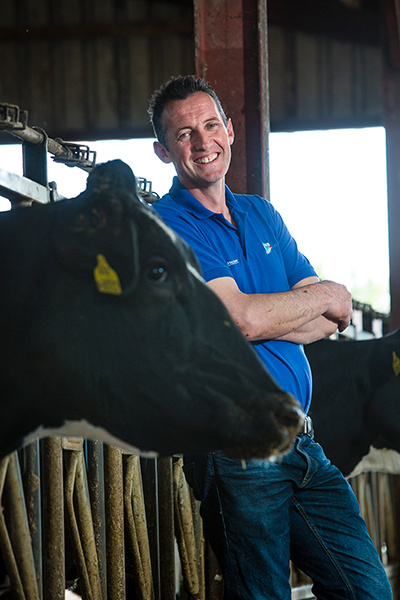 These changes saw Mike and his team through the winter, but this spring, facing a further reduction in milk price, Mike and James changed feeding strategy to maximise grass in the diet across the herd to push costs down. This took the form of turning out the low yielders to grass with buffer-fed TMR in a mobile bunker and introducing a cut and carry system on top of TMR for fresh and high-yielding cows kept indoors. James explains: “We were getting good grass covers and so were working towards the low yielders taking in half of their dry matter from fresh grass. But the grass was typical spring grass – high in sugar, low in fibre, plus we’d had lots of rain to take the dry matter down further. So while we’d previously – and rather unsuccessfully – tried feeding NIS to low yielders, we introduced it again in an attempt to balance for the lack of fibre and preserve butterfat. While it depressed yield a little when fed to the low yielders over the winter, this time yield held up and, just as importantly, so did butterfat and cow health at a point we expected both to suffer. In the high yielders, James and Mike added cut and carried grass on top of TMR to provide 25% of the daily dry matter intake. Again, both were concerned about how this would affect digestion, but feeding NIS at 3kg per cow per day actually lifted butterfat to 3.95% with overall ration cost 44p per cow (approximately 1.5ppl) below where they were prior to turn out. 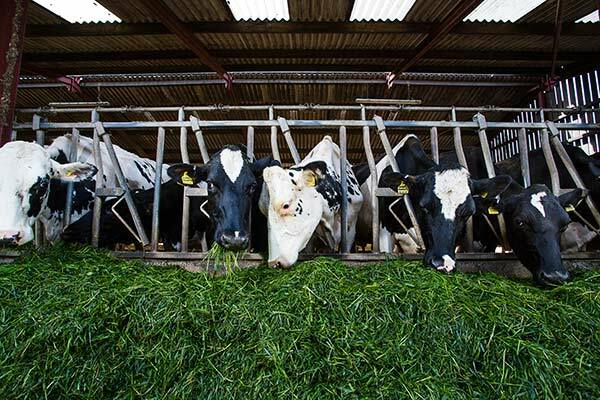 “I believe NIS plays a role in improving rumen efficiency when cows are under dietary stress. These days, if you can cut costs while using NIS to maintain cow health and milk quality, then that’s got to make sense,” concludes James.